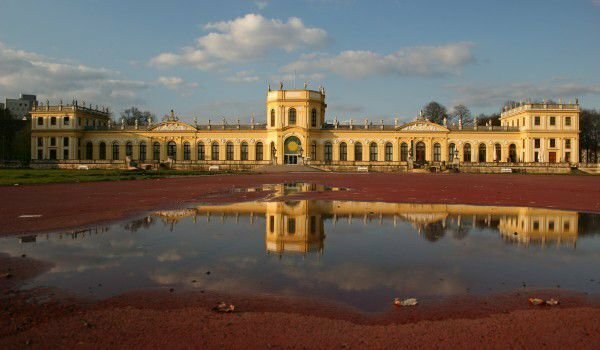 Orangerie in Kassel is a magnificent Baroque palace - one of the best examples of such architecture in all of Germany. Orangerie in Kassel is located just 400 meters from the former Royal Palace of the city. Its construction to this day is beautiful and the imposing building marks the beginning of the northern part of Kassel. Orangerie is located within the park of Karlsaue. The beautiful Palace is built as a peak in the beautiful gardens made by order of the ruler Charlemagne, who gave the name of the local area. The building was erected among the baroque garden in 1710 and is ongoing near the Fulda river gives completeness to the natural beauty of the park Karlsaue. A conservatory was built as a summer house or more like an enclosed indoor garden where cultivated orange, lemon trees and various palms could thrive. The presence of such a garden for the region was rare and was loaded with rare botanical specimens of the Mediterranean. Sufficient is the fact that the cultivation of such plants in an artificial environment requires enormous heating costs, proper lighting, etc. Simple heating of trees and various exotic species in these greenhouses in the 18th century was done by raising the hot air of a purpose-designed system. Around 1747 the greenhouse was home to a live rhinoceros named Clara, who showed particular respect to fruit grown in this beautiful palace in Kassel. The architect of the beautiful greenhouse was Johann Conrad Giesler, who built a 140 m long building, consisting of a one-story base with several two-and three-story pavilions in the design. In 1750 Baroque master - Johann Georg Kötschau carved the beautiful statues depicting various gods, goddesses and mythological figures that were once situated on the roof of the greenhouse. The Orangerie in Kassel continued to operate as such until the Second World War. Since 1992 the baroque jewel housed, Kassel's Museum for Astronomy and Science. Just after the door of the conservatory you can see a beautiful marble bathroom, which was designed by Pierre Etienne Monnot who lived in the Castle between the years of 1714 - 1729. During the previous century the sculptor began work on statues, which depict Greek and Roman gods and other mythological times. He sold most of them as they entered into the composition of the marble bath in his conservatory. There you can see part of "Metamorphoses" - a popular work of the ancient Roman poet - Ovid.